Gssd. 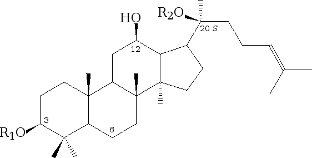 Rg 3 is the major panaxoside responsible for the endothelium-dependent relaxation of the vessels (in vitro rat rings in vitro, according to Kim1999grm ). This effect is at gssd. Rg 3 is about 100 times greater than the gssd effect . Rg 1 , its mechanism is probably activation of K + channels of endothelium. It acts inhibitory on adipocyte proliferation ( Han2006g2p ).